I started having kids when I was 36. Before that I was an assistant professor of education and English studies. Before that, I was a doctoral candidate. Once I got around to having babies, I had a hard time getting pregnant—no reason—just a stubborn reproductive system. But, when my body knew what to do, I had three babies in three years—no multiples. I went from teaching college courses and researching to breastfeeding and singing Elmo tunes. My point is that for me there is a clear demarcation in terms of my brain function: BK, before kids and AF, after kids. I was a fully functioning professional one day, and the next day, unbeknownst to me at the time, I was retired. To get a laugh from other moms, I would say, “The doctors told me after giving birth, the placenta is released. Who are they kidding? It’s brain matter that comes out—brain matter I never got back “ Since I lost brain matter three different times in three years, it was so obvious to me the difference in my cognitive abilities. I had the usual bouts of forgetfulness, like forgetting what I was talking about in mid-sentence, or losing my keys, or standing in a room for 5 minutes wondering why I was there. But then, I had more serious incidents. When I was pregnant, I left my car at the university to visit various gardens around Charleston, and when my friend dropped me back off at my car, it was running, with the keys in it. In fact, it had been running for over 6 hours. My friend laughed, but I was disturbed. And, it didn’t get much better after childbirth. I once locked all three kids in the van while it was still running. They were all buckled tightly in car seats, so I couldn’t get help from the innocents inside the running van. Then, I did it again a few months later. I kid you not. 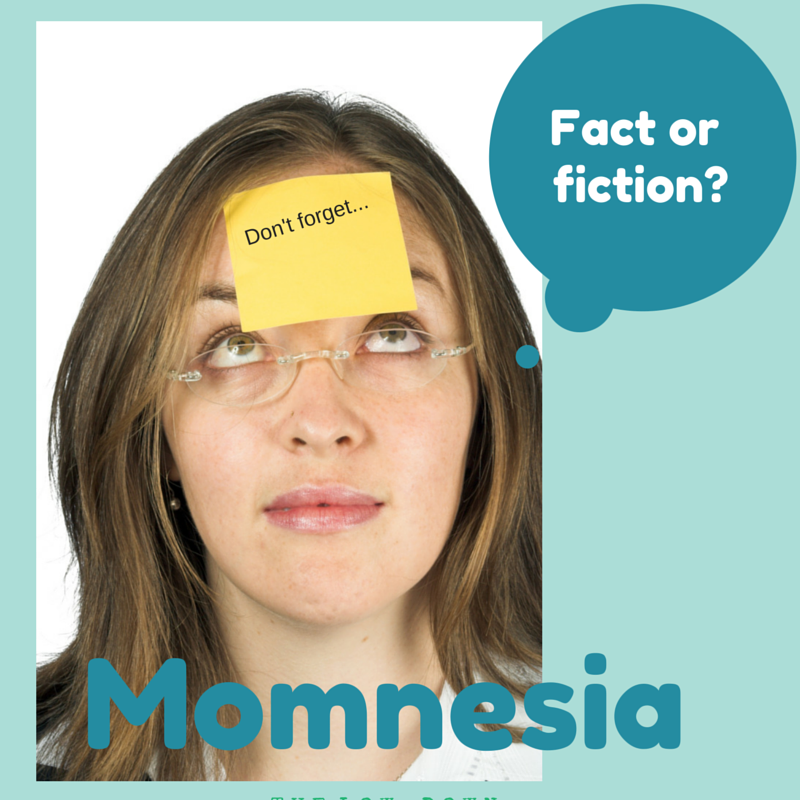 Every mom I know feels that she has memory loss and diminished thinking capacity during and after their pregnancies. Is it based in fact or is it an old wives’ tale? I have read some of the research, and like most things dealing with humans, it is complicated. A group of Australian researchers found that pregnant women performed worse on more complicated memory tasks than women who were not pregnant. Another study showed that even though there may be memory loss, there is really not diminished capacity in the brain. One researcher said that a woman’s IQ does not change when she is pregnant or post partum, but her priorities change. It turns out that I was right in my speculations. The things that make women feel less sharp after having a baby are hormones, sleep deprivation, and multitasking. Therefore, the reason new moms feel as sharp as an eraser is both biological and environmental. But, moms can take comfort in knowing they really haven’t lost what’s in their noggin, but just feel that way.